Someone went away for the weekend and I did some sewing. I did other things, too, but Saturday was mostly spent sewing, knitting and drinking tea. It was one of those perfect November days: calm, sunny in the morning, foggy in the afternoon, low light, damp air. I often feel like November gets forgotten about in the Christmas bustle. I did quite a lot. Some slow sewing on a silk blouse I’m working on that requires a lot of concentration. A random cushion cover I had been putting off. 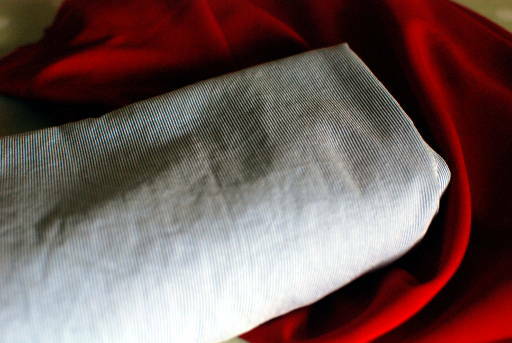 Then some quick fixes – another pair of jodhpur leggings like these and two tops. Yet another Renfrew top. Though this pattern really lends itself to many, many iterations, I have exhausted my fascination with the cowl neckline. Long sleeved jersey tops are my most worn item. Usually I buy them from Gap but have recently noticed that their quality and longevity has taken a serious downturn. 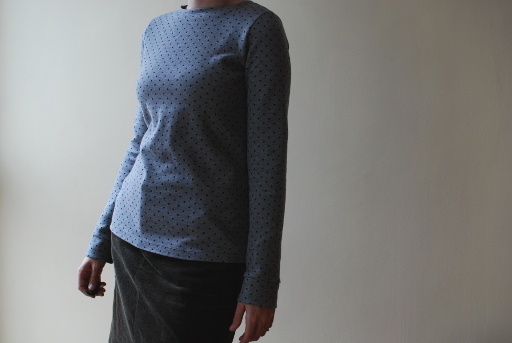 So, I decided to explore the crew neck version of my pattern. 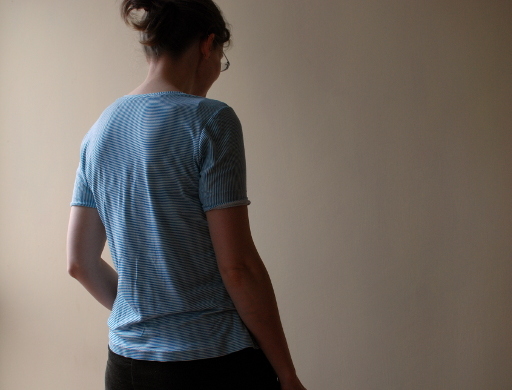 I raised the neckline 2″ at the front and wish I had done the same at the back. It looks ok though. 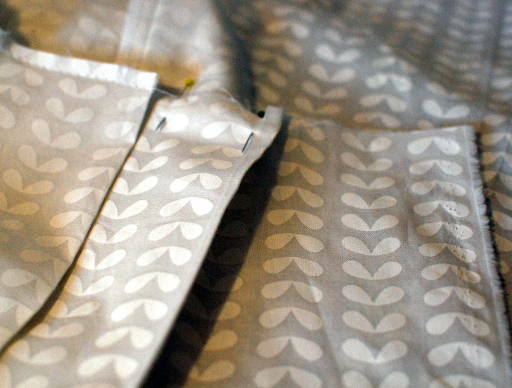 The (rather wonderful) fabric I received in the post on Friday. I decided to try out a new vendor on Etsy – Land of Oh. They’re based in Korea and what attracted me to them was their combination of reasonable prices with reasonable postage. Sure, I can buy for cheap from the US but postage tends to be crazy. It is pretty difficult to find good jersey in Ireland and the UK. Sure, it exists, but it’s about €20/m and often isn’t very good quality. 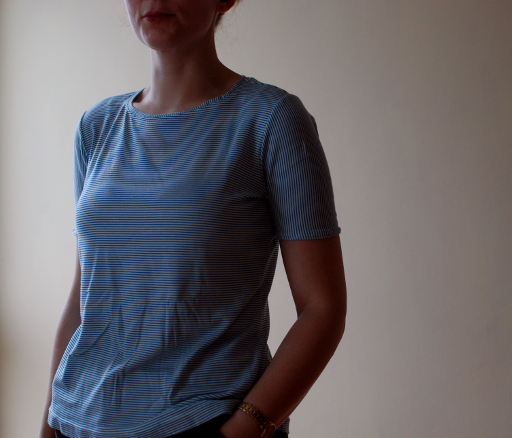 So I ordered this cotton interlock and a light chambray to try this shop out and was really happy with the service. They say to allow 3 weeks for delivery but I had mine in about ten days. They messaged me straight away when they had dealt with my order, and my order was exactly as described on the site. 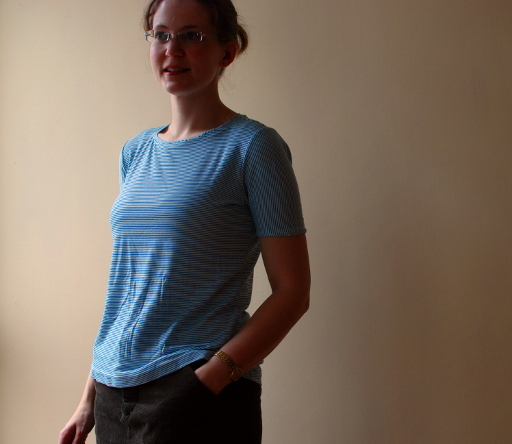 Other than raising the neckline, I lengthened the body by 7cm and left off the hem band. I used Bondaweb hemming tape, the kind where you put it in between the hem and then use the iron to glue it all together. 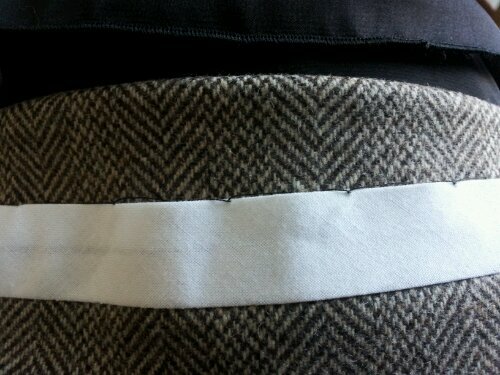 I did that so the hem wouldn’t go all funny when I twin needled it. It worked pretty well. The other thing I did was make the cuffs narrower. I took off an extra 2cm. I was really disappointed with my neckline initially. It was sticking up all straight, even though I topstitched it. I left it to one side and then, last night, I decided to get over it and read up all about knit necklines. Turns out I just didn’t press it enough! I used the Megan Nielsen tutorial. 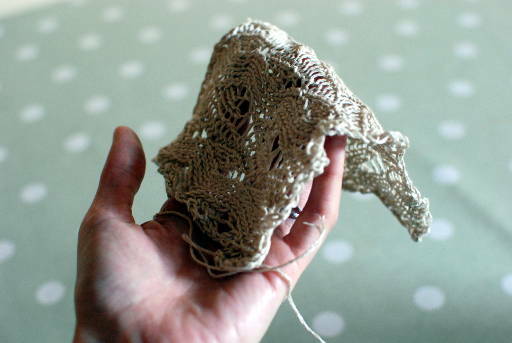 While I was on a roll, I decided to make something I’ve been meaning to do for ages and ages – make a knit Scout. I got this green stripe jersey at the 2012 K&S show for cheap and figured it was time to stop hanging on to it and just make it up! 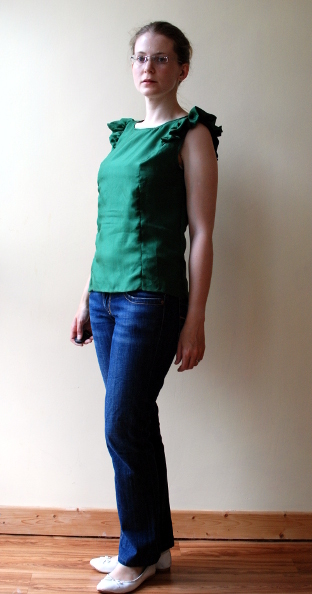 I used my modified pattern – I raised the neckline 2″ and my bodice has some waist shaping included. I also made the sleeves longer. I was talking to Alb when I took the photos so I didn’t notice my sleeve was flipped up there! I ended up taking the whole thing in about 2cm at the side seams. The neckline was a micro disaster but it turned out ok-ish. I think I may cut another binding and resew it. There are a few wibbly bits. Considering that this is more of a wearable muslin than anything I was expecting to turn out well, I’m pretty happy with it. As for the knitting, all I did was watching movies and crank out that teal Larch cardigan I was telling you about. 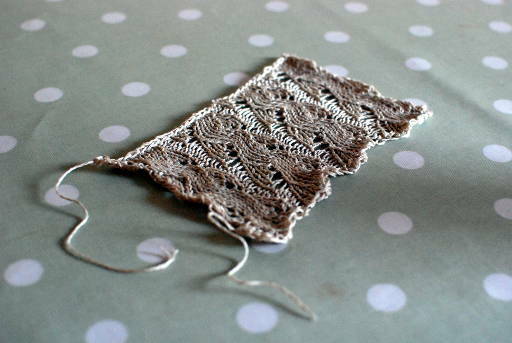 The good news is that I’m already at the armholes so hopefully I’ll have something interesting-looking to show soon. The story of this outfit goes back about three years to when I purchased a pair of brown boots. I had never owned a pair of brown boots before and so was unprepared to find that they went with nothing I owned! 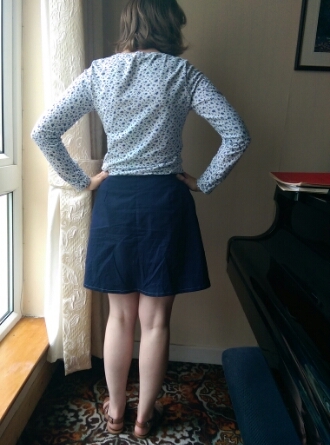 The logical conclusion was to buy a brown skirt. I found a nice, heavy cotton one in Zara for pretty cheap and wore it a lot with the boots. But it is not very warm and isn’t lined, either. It’s starting to look a bit shook up. 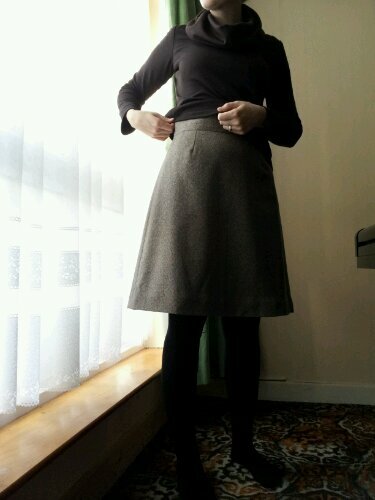 This winter I decided that should I come across some nice brown wool, I would make a new brown skirt. This day last week, I decided to visit Murphy Sheehy’s because I haven’t had a chance to visit in quite a while. They had just gotten a delivery of wools and despite the selection, this was the only decent brown. 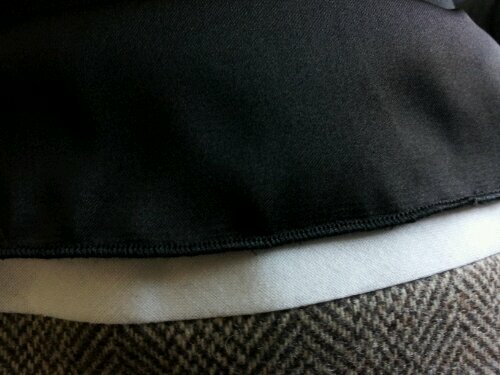 But it is very decent: a soft herringbone with beautiful drape. 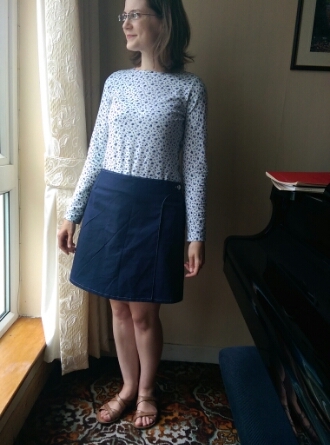 Pattern: The same one I used for my tartan skirt, the skirt part of Simplicity 8042. 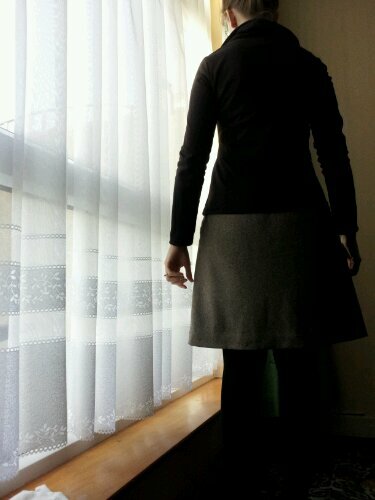 Fabric: The fabric was something like 160 or possibly even 170cm wide so I managed to eke the skirt out of about 60cm! I only bought a metre but still have a useable amount left over. I used a 100% silk satin to line it so despite the overall loftiness, this is a super-snug skirt. The top is another Renfrew! Check out the first one I made here. Leaving off the cuffs and lower band means I can squeeze this out of 1.6m. 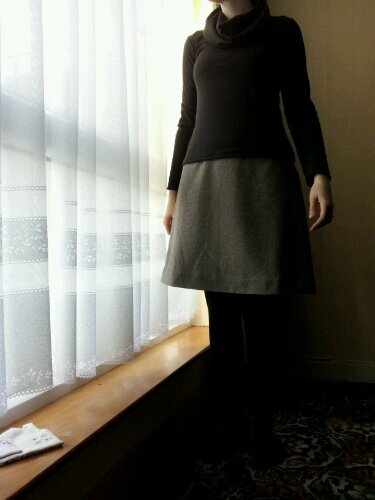 I used a 100% polyester ponte de roma knit that I got in Hickey’s. I really like the shape of the skirt. 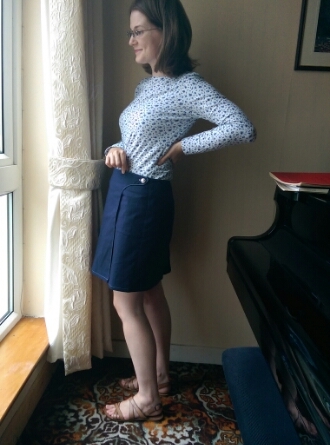 I think this is my go-to plain skirt, it doesn’t take very long to put together at all. 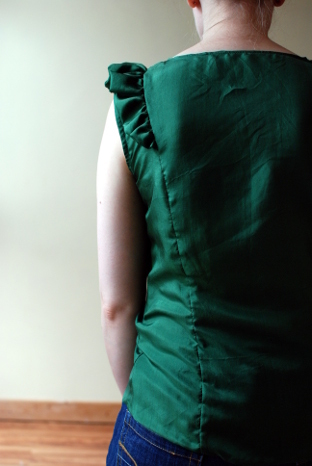 I used a bias binding to finish the hem. This was my first time doing this and it was really easy. I’ll probably use this from now on! 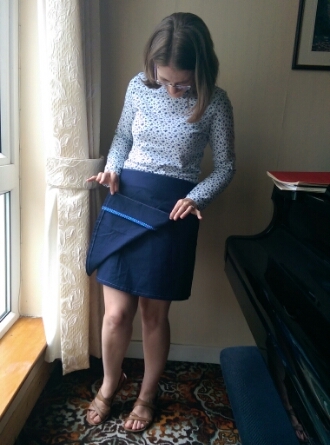 …And another first – I used the rolled hem feature on my overlocker with great success. 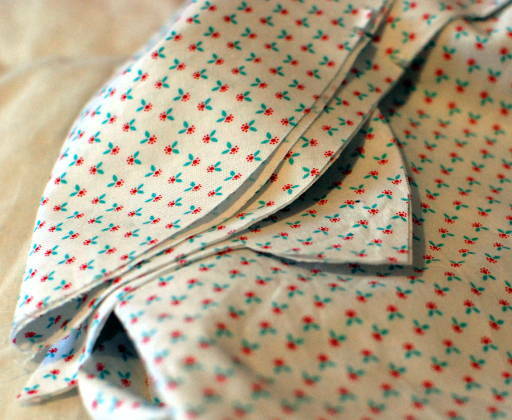 I am so unbelievably awful at hemming lining so this is my solution, I think, until I learn another way. It only took about five minutes! I used a silk satin to line it and whilst it is so lovely and not at all static-y with tights, I am so bad at cutting it out it’s not even funny.